The Brooke Large sofa is Hand Made in the UK with great skill and no compromise. The range comes in 4 sofa sizes, from the rather Grand 2.5m wide sofa to the medium 1.89m wide sofa, 2 chair sizes and a stool. 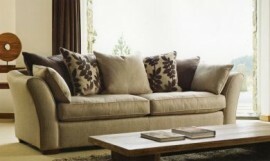 There is a choice of fabric for the body and a selection for the accent cushions. The seats and back cushions are fibre filled and the arm bolsters are feather filled. The feet are made from solid beech with a dark stain. The entire range is beatutifly made, but more importantly, it's made in the UK. I believe buying British is the best way to regenerate the economy from within. There are no shareholders, off shore accounts, factories in far off places, buy now & pay 2050 nonsense, just good old fashioned British made sofas. The money spent on this sofa goes to pay a British worker a fair wage, which then is spent directly within the local economy. All the VAT & Tax collected goes directly into the Treasury and benefits everyone.